First Nastassja Kinski’s dog, now this? I arrived in Uniontown shaking with exhaustion after a mere thirty-four-mile ride from Washington & Jefferson college. The distance was short, but it had been a tense day of gusty crosswinds on the narrow and busy US40. Directly ahead was a wall — a three-mile hill that I had been hearing about for days. I considered briefly and decided to worry about it in the morning. At about 4:00 in the afternoon I stopped at the Uniontown Mall to cruise the shops before seeking a motel for the night. I rolled the bike through the doors, clipped the security beeper to my sweatpants, and went for a stroll. A little window-shopping here, a scan of a magazine rack there — it was the usual mall experience with an unfamiliar constraint. I could buy nothing that wasn’t bikeable. I returned to my high-tech steed and found three women standing around it. Loretta, a spry and diminutive 78-year-old, was holding forth on matters of local history. Annie, an attractive woman in her fifties, was studying the bike and making notes on a scrap of paper. Mary, her striking five-foot-ten, red-haired daughter, was looking directly at me and smiling. The ladies were energetic, fascinated, and filled with compelling stories, and when we got around to the practical matters of interviews and places to stay, Mary set off to make a few calls. I nodded meekly and moved to obey, but Loretta — gray, tiny, and feisty as hell — placed a strong restraining hand on my arm and turned to the cop. “What!” she hissed. “Don’t you have any idea who this is? First Nastassja Kinski’s dog, now this? Well, ma’am, it’s down that way…” The cop, taken aback by the old woman’s intensity, was behaving like a child caught pulling his pants down behind the barn. “I’ll just have a word with him! You wait right here.” Loretta turned briskly on her heel and strode off into the Muzak-filled confusion of the Uniontown Mall. The cop shrugged and stood glumly aside to await judgement. I was quite willing to forget the whole thing and roll the machine outside, but then Mary reappeared with deep green eyes and a smile. She stood closer than before, and I felt a tightening in my chest and a sense of lightheadedness. This was unexpected: in fascination, I held our gaze past the point that marks the onset of intimacy. Her beauty was not the kind that dazzles at first glance, but the kind that slowly grows deeper, unfolding from moment to moment like a desert sunset. “The Herald-Standard is coming over,” she said softly. “Ah, thank you!” My imagination was soaring. “Yes, but I’m arranging a van ride now. We’ll get you there!” Through all this, her eyes remained locked with mine, making my heart pound as if I had just crested the hill of which we spoke. Mary was getting prettier by the minute, and I had to struggle to keep from immersing my hand in her flowing red hair. I was pleased to discover that I have something in common with Nastassja. I filed that away for my first date with her, and thanked Loretta for standing up for me. But now I had to take the bike outside anyway, for there was a newspaper reporter eagerly looking it over and mumbling something about losing the light. We did the interview — yielding a story called “14,000-mile Trip on Bizarre Contraption” — and I turned again to Mary. Smiles. Twinkles. We fanned the spark into a warmth that chased the evening chill as darkness blanketed Uniontown. Her features were full and well balanced; her voice melodious, almost tuneful. Every smile felt like a total-body massage with warm almond oil, and I was ready to follow her anywhere. Especially home. But one of the Pressley Ridge counselors arrived in the school van, and we soon found ourselves packing my awkward machine in the back. With a tingling hug I bid Mary farewell (“Call me,” she whispered), and we were off — climbing the notorious three-mile hill under gasoline power. Gasoline… I felt like I was cheating. I still wince at those fifteen miles of atlas marked not by a bold red line but by wimpy little dots. We turned onto a narrow road and coasted downhill for miles while the engine made muffled backfiring noises. 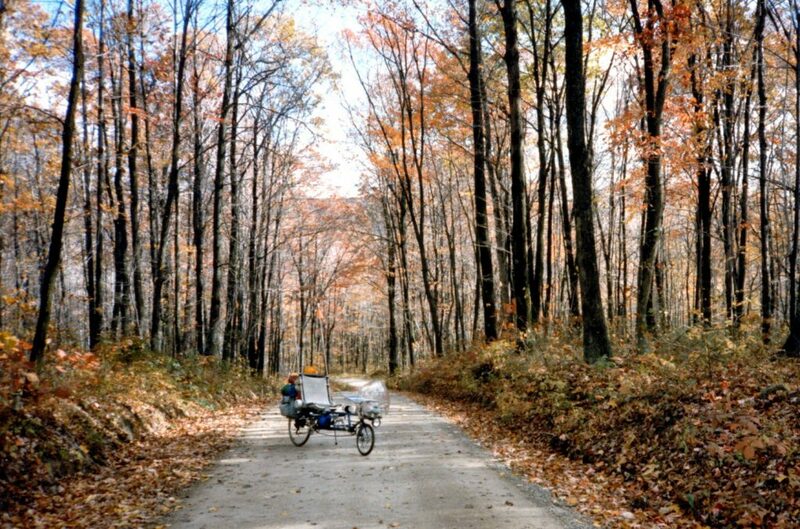 Autumn was well advanced here in southwestern Pennsylvania, and the van’s passage set up a rustling wake of elm and maple leaves on this little-used road. Daniel, red-faced and red-haired, talked with a proselytizing intensity about the school and the philosophies behind it. “But don’t you ever have runaways?” I asked. I was having a hard time imagining nearly two hundred youthful troublemakers living together in peace and harmony. Fascinating. I had always pictured schools for “problem” boys as institutional training grounds for young criminals, not idyllic communities in the woods. “There’s a lot to be said,” Daniel continued, “for the boys’ own resources. That’s what we try to encourage: their natural desire to learn. They have to develop math skills to plan meals and build shelters; they need language skills to produce the school paper. They have a library, and they really use it. When the boys come up with an idea for a field trip, they’re the ones who take care of planning and logistics. The whole program is based on curiosity and the desire to grow. There’s no stronger motivator.” He slowed the van and pulled up in front of a small, quiet building. We unloaded the bike and I rolled into the darkened dining hall. The boys were there: relaxed black and white faces illuminated softly by light from the screen. One adult stood in the middle of the crowd, operating the projector and talking above its fan. Unable to resist the opportunity for a grand entrance, I switched on all the bike lights. Brilliant one-per-second xenon strobes penetrated the darkest corners, and the wall behind me blazed yellow in the light from my barricade flasher. A small group across the room squinted in the headlight, and a rising chorus of “WOW!! !” drowned the voice of the speaker. I wailed the freon horn in greeting. A sort of mutual fascination developed between us, growing stronger the next day as I wrote an article by their huge fireplace, strolled in the woods, and toured their elaborate homebuilt living facilities. “We periodically have the boys tear down their cabins and start over,” Daniel told me as we walked a long path to the Quehanna tribe area. I found myself filled with envy, wishing that my education had been so well-rounded. In an emotional farewell talk to a small group, I tried to convey this feeling. We shook hands all around, and the circle of small faces looking up at me wished me good luck and asked me to “send a card from out there, man.” They called me Chief, and said a solemn good-bye. One of the counselors later commented that some of the boys would probably build a model recumbent bicycle out of saplings. And then I was off to the nearby hostel for one last night in Ohiopyle. The hostel here, like every hostel, is unlike every other hostel. Awash in whitewater rafters who come to challenge the mighty Youghiogheny, it is a spirited place, plastered with contour maps and posters. Canoes and rafts litter the yard, and the resident family is alive with the joy of travel.